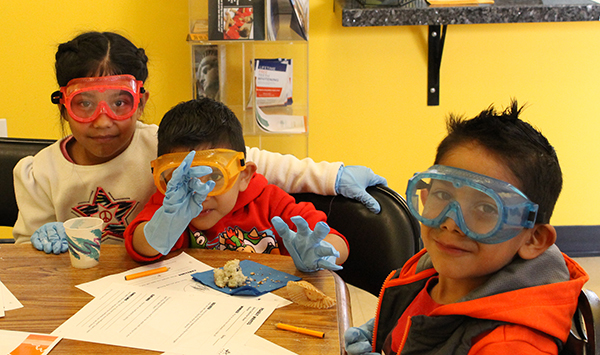 Science workshop with children of janitors members at SEIU-United Service Workers West. The UCLA Labor Center is pleased to announce that it will build upon its Parent Worker Project, a project that trained a cohort of janitors to become advocates for their children’s education through a new initiative, Garment and Domestic Worker Parents Navigate Work, Schools, and Community Resources for their Children’s Success. This new program will focus on improving children’s educational outcomes by engaging low-wage garment and domestic worker parents in their children’s education in new ways. Transformative parent engagement, community resource assessment, and culturally relevant financial literacy programming in schools, community spaces, and local worker centers are the tools and activities that will guide this initiative. The project is grounded in the expertise of two leading worker centers; the Garment Worker Center (GWC) and IDEPSCA (Instituto de Educación Popular del Sur de California). For over a decade, the UCLA Labor Center has partnered with these organizations on various research and social justice initiatives such as wage theft, fair and just working conditions, and the “Fight for $15″ to increase CA minimum wage. “While we know that low-wage parents face a host of challenges, we hope this project will empower parents. We plan to develop 25 garment and domestic worker parent leaders to train their neighborhood worker peers about being their child’s first teacher and accessing community resources such as libraries, museums, financial institutions, and specialized programs,” explained Janna Shadduck-Hernández, Ed.D., Project Director UCLA Labor Center. A team of parent leaders, organizers and educators from the Labor Center, the GWC and IDEPSCA will facilitate the implementation of Spanish-language curriculum, Abriendo Puertas, focused on parents as first teachers. A science and arts program by the National Council of La Raza, will engage workers’ children in creative and innovative activities while parents learn about child development, financial literacy and community resource mapping will also be implemented.